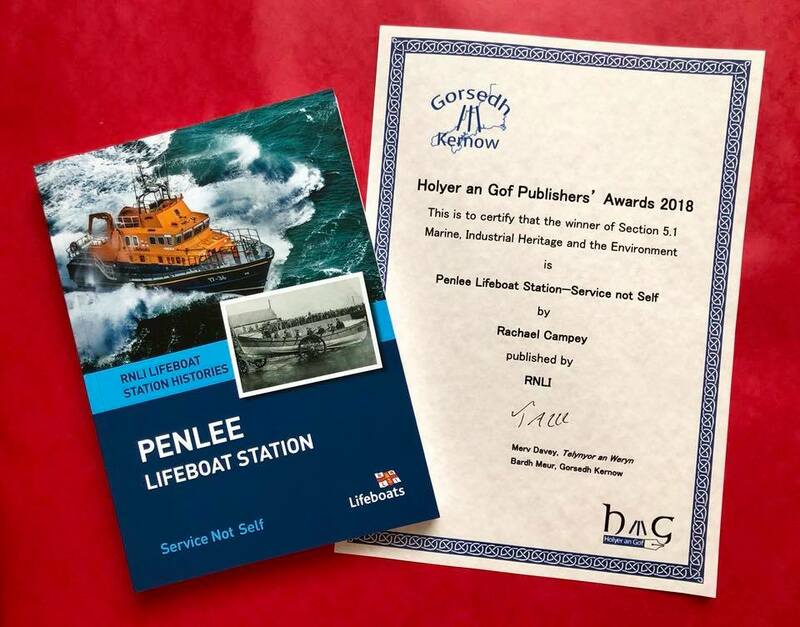 We are very proud to announce that the Penlee Lifeboat History Book ‘Service Not Self’ written by Rachael Campey won the Holyer an Gof Publishers’ Award 2018 in the Marine, Industrial Heritage and Environment category. There was some tough opposition in this category with a number of outstanding books and authors, but the Penlee book, beautifully crafted by Rachael, shone through. Rachael is an award-winning journalist and editor based near York. She has edited three regional newspapers and was deputy news editor on The Times. She is now a freelance writer. Rachael comes from a seafaring family, her grandfather was a master mariner who ran away to sea at 14 from Padstow. She loves Cornwall and maintains a close bond with Mousehole and RNLI Penlee.‘Service Not Self’ took three years to research and write, a true labour of love. The book is a wonderful tribute to our current crews and to all those who have bravely gone before.